For a long time, I’d been hearing about Wine Vault & Bistro (which can get confusing since I’ve also had people tell me about Wine Steals, WineSellar, and some other wine place/bar/eatery). I’d kind of just written it off, since I didn’t get how they could put together a 5-course meal for $30 that would be worth eating. I’m also very skeptical of places that are constantly being raved about. This is probably due to my experience with the now-closed The Better Half, which certain sources couldn’t get enough of and when I finally tried it I thought I was eating food that came from those heat-and-serve lunch kits you find at Trader Joe’s. Utterly disappointing. You have to sign up for the newsletter to get the Saturday night menu for Wine Vault (as well as their wine pairing menus). I guess you have to go in person to see what’s on the regular bistro menu? I finally signed up and then the stars aligned where we had plans that got cancelled and pork belly was on the menu. Reservations were made and I started getting excited. I don’t know if you always need reservations – we were there at 6 pm and the place wasn’t full at all. By the time we left after 7 pm, I’d say it was 75% full. Travis didn’t like that you had to go to the bar to get your drinks. He did like that you could do a beer flight for $9 (5 tastes, to match the 5 courses, I’m guessing). I had planned on splitting a wine pairing with him, because I am a lightweight and fall over easily, but since he was set on trying to match beers to the food, I had to drink all the wine by myself. And it was a lot (for me). I agree it would be easier (for us) if someone would just bring us our booze tastes, but I also understand how it’s easier (for them) to have it all at one station and then people go up at their leisure. I’m guessing if you have too many people falling down on the way to the bar, you could also make the decision that they’ve had enough to drink. Each plate is a few bites, which means you won’t leave stuffed. We did leave full, though, or at least not hungry. And I’ve heard that the first few bites of anything are the most satisfying, so at least you won’t get bored with anything. 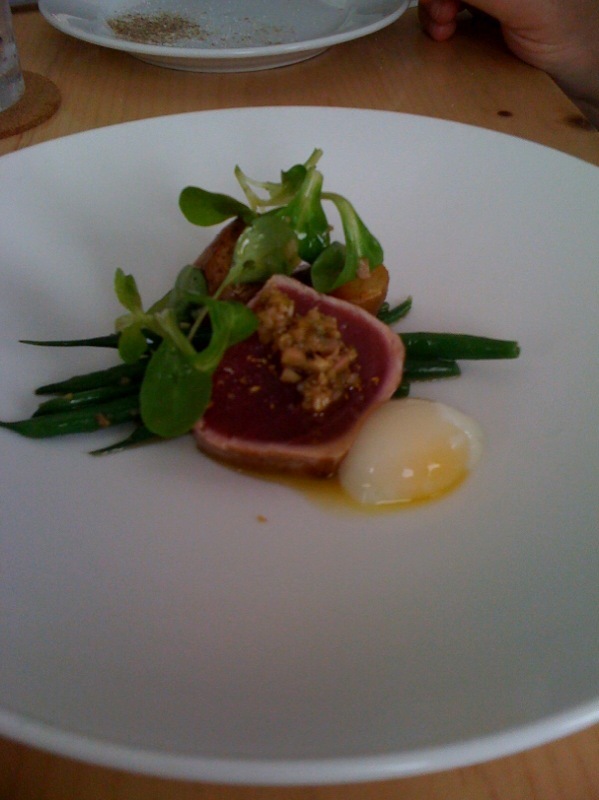 The salad nicoise was like some deconstructed salad. So, while it was tasty, it didn’t really all come together as a complete dish. But each component was delicious. My last bite was egg yolk and a crispy potato, which was better than Travis’ last bite of egg yolk and green bean. This was my favorite dish of the night. The sweetness of the artichoke heart (I love artichokes like crazy) with the sweetness of the shallots was perfect. I could have eaten a bowl of this. 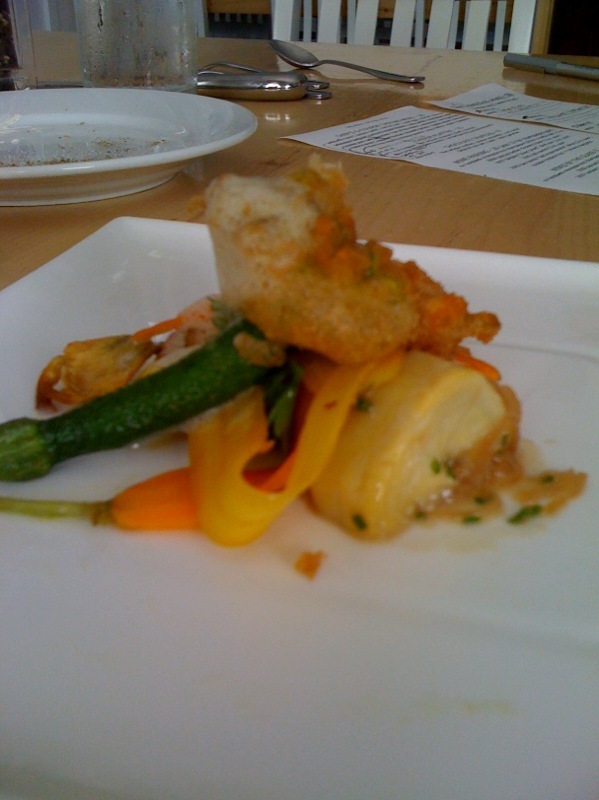 There was also a tempura-fried squash blossom, that was delighfully crispy. The pork belly was not falling apart tender, but it wasn’t tough and chewy, either. And it had a crispy, salty, porky top crust which pretty much made us love it no matter what. We had no idea what eggplant fondue was, and even now I’m guessing it was the creamy blob on the plate. The brussels sprout leaves were tender-crisp (does that make sense?) and makes me want to make a salad of just-blanched leaves. 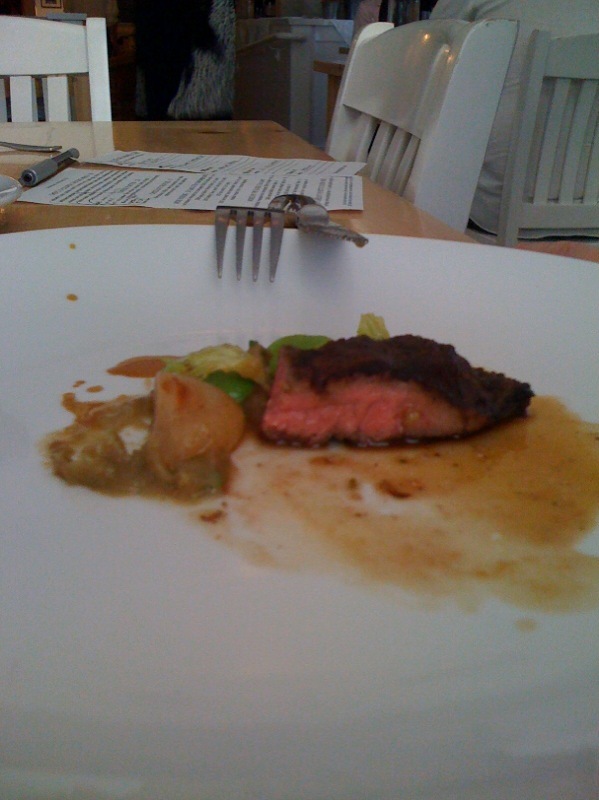 I don’t know if you can see it, but the steak was pretty rare in the middle, which made it a little chewy. This was actually my least favorite bite of the night, but the flavors were all spot on. Travis was surprised that the candied cherry blossom was salty, but I seem to remember eating salted cherry blossoms. So, either these were salted cherry blossoms that got candied but weren’t sweet, or they were never candied. The cherry ice cream was perfect and creamy and full of cherry-flavor. The cake as a whole was light and fluffy and a nice way to end the meal. Even though we also got gelato later. And I just realized there was no mochi. Now I’m sad… homemade mochi would have been a fun treat. Prunier “La Lieutenance” Orange Cognac I just noticed that instead of cognac, I had some tequila/coconut/fruit blended drink. I would have paired the Cheverny Blanc with the artichoke and the Pinot Noir with the pork belly, but the Shriaz went well with the steak and I thought all the wines were fine overall. Nothing outstanding, but I also wasn’t expecting outstanding wines at these prices. I didn’t drink the tropical margarita-thing because I don’t like tequila and I was already a little boozy by then. I’d like to go back on a Thursday or Friday to see what the bistro menu is like, and I’m also keeping an eye on their Saturday menus since I do think it’s a pretty good deal and we did enjoy the food a lot. I don’t necessarily need the wine pairings (I like food more than booze) so that makes future visits cheaper, I guess. If it was closer to home, I’m sure we’d be there much more often (driving down from Poway when you’re all comfy at home on a Saturday takes some effort). Plus, I still have a very long list of tasty places we have yet to visit. 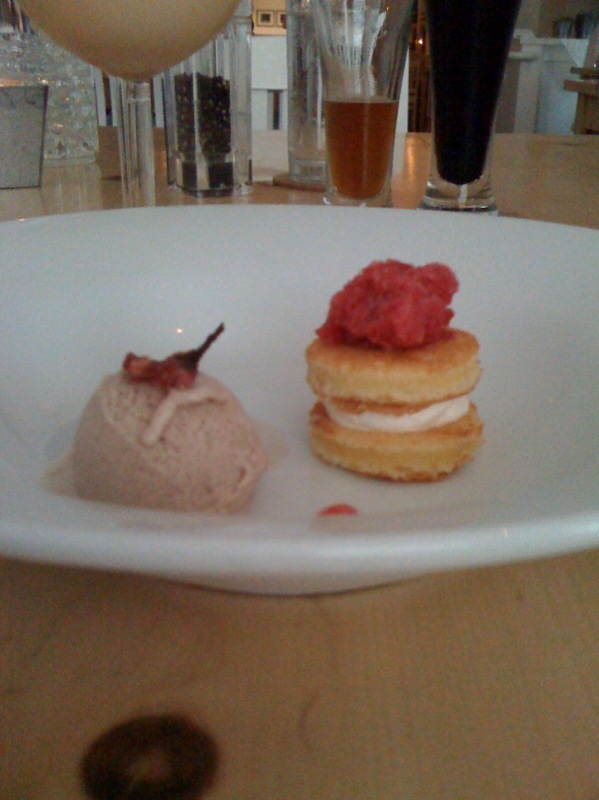 This entry was posted in food, restaurants and tagged food, wine pairing, Wine Vault & Bistro. Bookmark the permalink. We heard some fun stories about the better half recently, it really sounds like the chef had some serious substance abuse/mental issues and that once the other dude went it got even worse than it already was getting! I head the Thursday/Friday menus have up to 3 choices for each course. So you’d have some variety there. 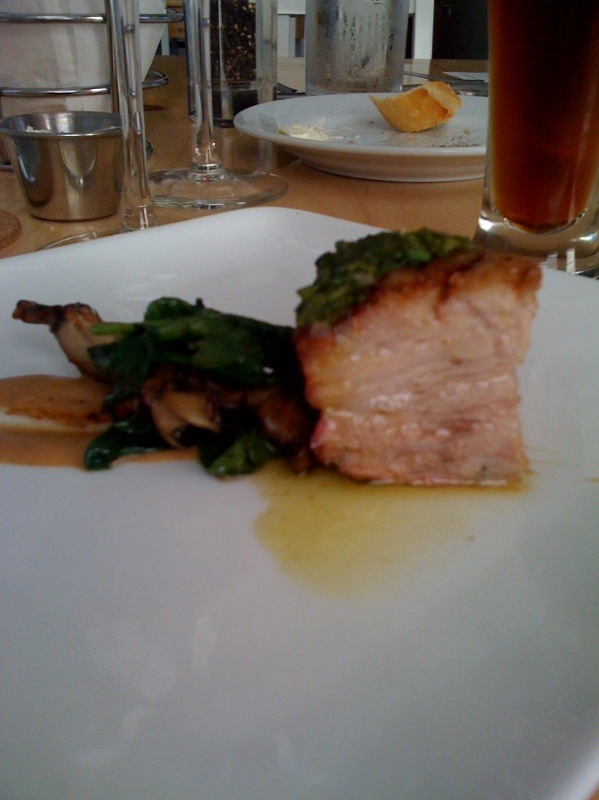 Of our Saturday menu, the non-meat dishes were the clear winners (but I’ll always love pork belly, no matter what). that looked totally interesting – and i have to agree with you – pork belly is totally awesome. i got the grill pan this week – i’m hoping to use it over the weekend and make some kind of post about it! thanks! The Thursday/Friday menus have about 5 choices for the app and entree courses, about 3 for dessert. It’s a lot more varied than the emails lead you to believe. I also tried their Stone beer dinner and it blew me away. However… fabulous meal after fabulous meal, we finally brought friends there… and it sucked. Food preparation wasn’t up to snuff and the portion sizes went from small to literally bite-sized. Even for $20, it wasn’t worth it. So, a 90-ish% success rate isn’t bad, as all restaurants have their occasional bad meal.